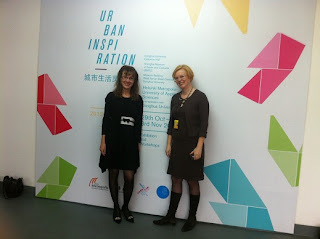 The ambitious and very demanding project of Helsinki Metropolia participating in the Radical Design Week Shanghai 2012 is over since 21 days. I am glad and proud to say that the exhibition week Urban Inspiration from Finland at our partner university Donghua was a great success. We had, of course prepared everything thoroughly and worked hard more or less the whole year through to make it happen, so I knew what we were doing and I believed in it. But still, I have to say, it was such a wonderful experience to lead a delegation of 26 staff and student members and share their expertise, commitment and good spirits. My sincere thanks to every single person. You did a great job! The Scandinavian idea of design belonging to everyday life and equally to all residents is, indeed, very radical in a global scale. Our decision makers´seminar in Shanghai, under the title Wellbeing for All, made it very clear to me that co-creating is the key word for the future urban planning. Finland is a small country, but is is said to be a world-class superpower of education. In finding human-centered solutions for better life Helsinki Metropolia can play an important global role, as well. It is quite often that the big ships need lighthouses to get to the harbour, isn´t it?